This will be an evening featuring virtuoso acoustic guitar performance joining forces with singing, saxophone and piano. International Fingerstyle Guitar Champions Helen Avakian and Mark Sganga, internationally performing saxophonist Christopher Brellochs, music director/vocalist Liz Gerbi and guitarist Dave Irwin will share the stage, with everyone getting a chance to play all together, in smaller groups and solo. These artists are well versed in popular, classical, jazz and musical theater styles, plus they all sing; so expect a concert filled with variety from originals to soulful Carole King songs, Ralph Towner-esque jazz, Brazilian, Celtic and Americana styles. Helen Avakian is an award-winning singer/songwriter/guitarist recently relocated to the Madison, WI from the Hudson Valley. In September 2014 she won the International Fingerstyle Guitar Championship, the first female to do so. Helen was voted the No. 1Favorite Acoustic Act four times by Rhythm and News magazine and she has won numerous songwriting awards, including seven first prizes from the NewSongs Contest at the Walnut Valley Festival in Kansas. 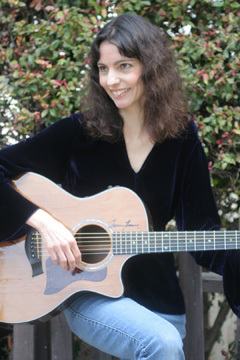 Her latest recording, “Notes from Helen,” recently made it to the finals of the international Just Pain Folks competition for Best Guitar Album and has received this praise. Helen will be joined by Dave Irwin, a longtime well-known guitarist in Madison, WI who specializes in fingerstyle, Brazilian and jazz guitar. Dave has appeared on ESPN performing his solo guitar arrangement of the National Anthem. Mark Sganga’s fingerstyle guitar weaves a rich tapestry of beautiful melody, dynamic rhythm and imaginative improvisation. Fusing influences from South America and around the world, Mark creates an entrancing travelogue as an instrumentalist, bandleader, singer/songwriter and educator. 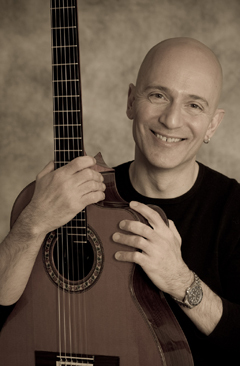 2009 International Fingerstyle Guitar Champion, Mark has enthralled audiences from Stockholm to Kuala Lumpur to the Thredbo Jazz Festival in Australia. His dynamic playing has been featured on tours and recordings with Indian violin virtuoso Dr. L. Subramaniam, alongside Larry Coryell, Herbie Hancock and Taj Mahal. Back in New York, Mark has appeared at the top listening rooms such as SOB’s, and has performed numerous times at Iridium, often as a guest of the legendary Les Paul. Mark Sganga and his Trio headlined at the Cape May Jazz Festival in New Jersey, and he curated a Summer Concert Series at Torne Valley Vineyards where he led several all-star groups. A lifelong music educator, Mark has co-led Master Classes for The Les Paul Tribute Festival at Ramapo College of New Jersey, where he is now an Adjunct Music Professor. 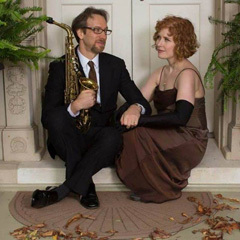 Christopher Brellochs (saxophonist, composer, conductor) has performed in all numerous musical styles throughout the United States, from well-known New York City venues like as Birdland, 55 Bar, and Smoke to prestigious Carnegie Hall. International performances have included guest appearances in France (Paris and Strasbourg) and Germany (Cologne and Trier). Brellochs’ recordings include Quiet City(2011) which features the world-premiere recording of Aaron Copland’s complete incidental music for Quiet City. Brellochs is Chair of the Music Program at Dutchess Community College in Poughkeepsie, where he conducts the Mid-Hudson Community Orchestra and Jazz Ensemble. Elizabeth Gerbi is well known across the Northeast as a singing teacher, voice coach, choral conductor and music director/pianist (150+ productions). As a singer-actor, she has appeared in regional productions ranging from Annie Get Your Gun to The Kenny Rogers Christmas Tour. Recent projects include musical directing The Chris Betz Show at Rose's Turn and The Sage Theatre in NYC, Side Show and Tommy at Westchester Broadway Theatre, and The Sound of Music at the Wagon Wheel Theatre of Warsaw, Indiana, adapting Starmites 2000 with Broadway composer Barry Keating, and accompanying master classes for Broadway veterans Ken Jennings, Lindsay Mendez and Lisa Howard. She is also currently serves as a both New York State School Music Association Solo Adjudicator and a respondent for the Kennedy Center American College Theater Festival, and has been a member of the Theatre/Music faculties at The American University, SUNY New Paltz, and SUNY Dutchess Community College.